After multiple shifts with plastic surgeons in the OR they take over after mastectomies or other cancers are removed. They are called to the Emergency room to evaluate superficial , I appreciate not only their physical skill, but the variety of their patients trauma. In clinic, they see those hoping for cosmetic fixes (closing a diastasis between the rectus muscles) and those needing long-term wound care from paralysis. They also work on the damage caused by gunshots (sometimes while the patient is under police guard). In clinic the residents and medical students do a first pass with each patient, then the attending joins them to finish up. Though a slow process, the teaching that occurs is obvious. One particular case highlighted the need for remembering or reviewing anatomy. The patient, a woman in her early thirties, went to the emergency department on the weekend. She claims to have grabbed the wrong end of a “butter-knife” in order to cut some cake. The cuts on her dominant right hand were located at the metacarophalangeal joints of fingers four and five. After her wounds were cleaned she was asked to move each digit. The pinkie finger would not comply. The residents opened the skin wider to confirm the flexor tendons were intact. While they saw and pulled on one, getting the appropriate response, at this site the superficialis divides and hides. Though they stitched her up and expected all would be well in a week, at clinic the attending took one look at the straight finger and suggested surgery to repair a cut tendon. 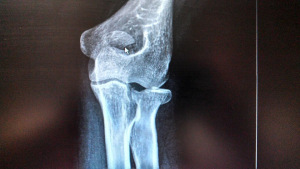 The residents did no harm, and learned to be a bit more thorough even when called in on such a small injury. A cardiothoracic surgery to remove masses from the lung amazed me by not only the coordination of the surgeons, but their ability to use imaging and touch. The patient was ventilated as needed for the doctors to reduce the size of the lung tissue to see around inside the chest. Seeing the wounds closed with preloaded rows of staples was an “aha” moment for me. 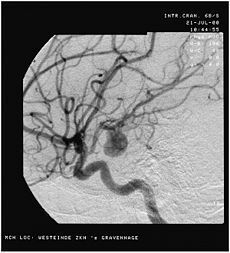 Angiography of an aneurysm in a cerebral artery. Source: Wikipedia. Wednesday morning: oncology. The patient had previously had their cancerous gallbladder removed by laproscopy, but the margins came back still positive for cancer. Today the surgeons had to open the patient to take out part of the liver. A row of staples won’t work in this case. Cautery, fibrin laced mesh and a tissue gel all helped seal the remaining organ. Last shift of the week, Friday afternoon to evening. The neurosurgeons had an aneurism to clip. By the time I arrived the right temporal and meninges had already been reflected. The angiogram was displayed on video screens in the operating room. Doppler was used to “hear” if the clipped vessel was completely closed. Before they closed the skull I noted to myself that the brain does not appear as impressive as its many functions truly are, and I don’t think I could be a neurosurgeon. Not due to the physical talents necessary, but for the mental risks involved. Things I learned in my first week as an intern. Don’t use the elevators or stairs closest to the operating rooms! It was no big deal when the elevator wouldn’t go, it let me back out. The stairs though…require a special card to get out of. Meaning once you get to correct floor you better hope someone else shows up. And when you are supposed to be “early to be on time” waiting around just won’t work. Plastic surgery isn’t a service I looked forward to observing. It has always struck me as a combination of elective and gruesome. If I got to see reconstructive surgery of an injured child with cleft palate or some other noble procedure that would be great, but no such luck. I got to watch the end of a “bilateral blepharectomy” (eyelid tucks) and facelift. It was amazing the amount of spare skin snipped off after the surgeon finished “loosening up” all that tissue. I wondered if the patient would deem her appearance that big of an improvement…I overheard she’s a college professor. Urology service had a lecture and their “M&M’s” (morbidity & mortality conference) which wasn’t as exciting as TV. Learned more about catheters than I hope I ever need to know, but still wonder why the bladder’s smooth muscle gets a title (the “detrusor” muscle instead of just calling it the muscularis layer). Spent whole neurology shift in the OR watching bones being pinned together from osteomyelitis. Lots of titanium went in to hold everything from T-10 to the pelvis together. The surgery was a success, but the patient is elderly, and in renal failure…making me wonder if it was worthwhile. The most important thing I had to do before observing surgical shifts at the UC Davis Medical center was to get good shoes. The recommendation by former interns: Dansko clogs. The dress code for arriving is business casual, usually followed by a quick change into scrubs. My first morning I shadowed a resident from the burn service. Most of his patients were children seen across the street at Shriner’s hospital. 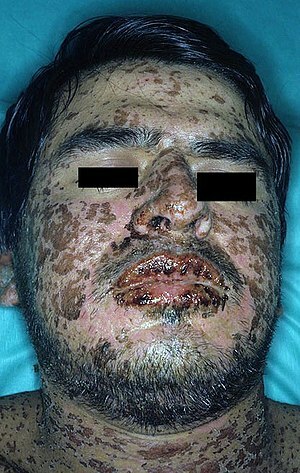 In clinic he checked on three boys: one with a dog bite, the next had Steven-Johnson syndrome (see pic) where skin is lost due to a drug interaction, a finally a burn. The worst burn was in an adult from electricity. The treatments are similar since all affected the integument. Morning rounds with the vascular team were impressive. Starting at 5:15am they raced like a pit crew from patient to patient, not only checking for changes overnight but replacing wound dressings. A large number of their patients are diabetics, feet having the worst circulation. In the afternoon they began an angiogram/stent of a carotid artery. The patient was distressed but didn’t seem to understand her movements lengthened the process greatly. I stayed late and heard the attending checking to see if she had suffered any brain damage…fortunately not. My internship at UC Davis Med Center began immediately following our HAPS conference in Vegas. So, while others were touring the Hoover Dam or the Grand Canyon, I had a daylong drive north. For the three months I rented a room in walking distance, but it’s not a very good neighborhood for walking. My first day was hospital orientation. Fifty pre-meds needing badges for access to the medical center. To pass inspection we needed a number of health documents. I hadn’t seen proof of my own childhood immunizations so blood titers and boosters sufficed. After paying $5 we were ready for a weekend long crash course in, of all things, human anatomy! I must say I felt pretty comfortable hearing medical student summarize the systems. The only new information was on taking patient histories and physical exams (neither of which we are allowed to do). The fact that they stressed directional terms made me feel good about teaching it to my students. And happy to say before my first shift in the med center I passed all of the quizzes at the required level of B or better. I chose three shifts a week to start, the surgical specialties I’ll be shadowing are assigned. The busiest shift during the week is 6am to 1pm, followed by the 1-7pm. NIght shifts, 7pm to 2am usually only cover traumas or emergency medicine. I’m sticking to weekdays for my first month. Cross your phalanges for me! I decided to be a role model, so had to go through the motions of applying. The easiest part was paying the $20 application fee. Having been a professor of anatomy for over 15 years, I have done my share of recommendation writing. However, I haven’t had to ask for letters since receiving tenure. Fortunately, just for fun, I took microbiology from one of my colleagues just a year before. So, my letters came from him, my orthopedic surgeon, and my boss. The hardest part of the application wasn’t getting all my transcripts into a single pdf, it was the essay questions. They were intended for undergraduates, but some still applied. “What do you do when not in school?” Others were thought provoking. “What moment in history would you like to have witnessed and why?” When you know there are no right answers, it’s hard to decide when you are done. I submitted everything on-line and on-time, and felt like I had gotten in touch with what my students go through. I imagined that I might be so overqualified as to not receive an interview, so I started thinking about what hobbies I could take up for summer. Then of course I was invited to interview. By this time I was torn between my competitive nature and desire to be lazy all summer. The interview was only thirty minutes, for which I had to spend money on round-trip air, hotel and rental car. I even bought a new outfit. When I arrived, it became obvious I was not only the oldest applicant, but I was close to double my interviewers ages. These questions were more serious than the essays covering ethics and motivation. When I was accepted, I secretly felt guilty for taking a spot away from some truly motivated premed. But the truth is, I will learn whether or not I want to be a surgeon and everything I see will help in my teaching. Now let’s hope I can keep up with the residents. Last Fall I got roped into serving as an advisor to our “Caduceus Club” at Pasadena City College. These students want to go into health-related careers…and even if I never did, I agreed to open a classroom once a week at lunch for their meetings. During their meetings I heard the guest lectures and learned a lot about our campus blood drives, but mainly served to encourage them in their academic pursuits. However, I also got e-mails of off campus opportunities to share with them, one of which really caught my eye. Last November I tripped. Really hard! Caught myself by sticking out my left hand (my right hand was full and couldn’t get empty quickly enough). The good news was I kept my face from hitting the ground. The bad news was I locked my elbow and apparently the head of the radius shattered on impact with the capitulum of my humerus. I am now the owner of a titanium radial head replacement. I asked my surgeon if I could watch the operation, but he said no. So, there is a program at UC Davis where premedical students can shadow surgeons. I already have all the prerequisite courses, even if I never seriously thought about becoming a doctor. I decided that to be a good advisor I should lead by example. If nothing else, applying to the program would help me understand what my students who need letters of recommendation are going through, right?